It’s in the Okavango Delta that lion prides face off against buffalo herds, where elephants drift like silent grey battleships across glittering floodplains. Leopards, cheetahs and wild dogs stalk the delta margins; hippos and crocodiles pack its waterways. The Okavango Delta in Botswana is one of Africa’s last great wilderness areas. An unspoilt wonderland of permanent and seasonal wetlands, it combines epic game viewing with stunning scenery to deliver an unforgettable safari. A World Heritage Site, the Okavango Delta falls largely under the protection of the Moremi Game Reserve and adjoining privately-run concessions. Accommodation is widely available throughout the delta and you’ll have the luxury of choosing between different kinds of lodges – family-friendly, value-for-money, honeymoon-perfect and super-exclusive. Shared charters in small aeroplanes are the best – and usually only – way in and you’ll enjoy mesmerising views as you fly over the delta. 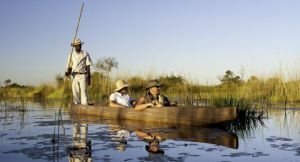 With your guide, you’ll explore the Okavango Delta by boat and traditional canoe as well as on foot. Lodges lying on drier land offer 4X4 game drives, and accommodation in private reserves are permitted to conduct night drives too, an excellent way to spot Botswana’s nocturnal animals. 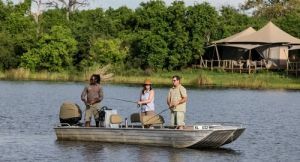 Ask us about the best Okavango Delta accommodation for your expectations: some camps are more water-oriented with permanent boating activities while others are land-based and focussed on game drives with only seasonal water activities. You’ll need to choose the timing of your Okavango Delta safari carefully as it is a seasonally affected destination. Flood water arrives at the start of the dry season, greatly expanding the size of the delta. Animals arrive in great numbers and water-based activities are easier to guarantee. 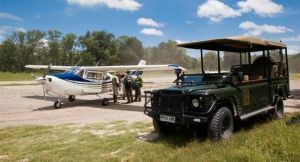 Game viewing by vehicle is however often best during the late dry season and bird watching is at its most diverse in the rainy season. 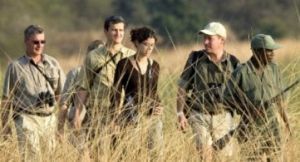 Browse our recommended accommodation and suggested itineraries for an Okavango Delta safari. Usually combined with Chobe National Park and Victoria Falls, the Okavango Delta is served by Maun airport, Botswana’s travel hub. 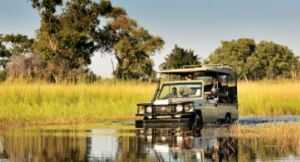 This means easy connections with South Africa and beyond, putting the Okavango Delta at the heart of an unbeatable Southern Africa itinerary. Steered by a local guide, your flat-bottomed mokoro (canoe) takes you into the delta’s shallow wetlands – great for birding & photography. Contact us for more info about lodges and high water seasons. 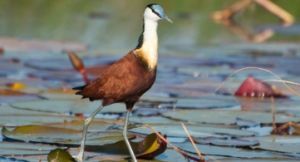 Guided nature walks on the islands of the Okavango Delta are a highlight for many visitors – you’ll learn about medicinal trees, look for rare birds, identify animal tracks & get to see some animals. 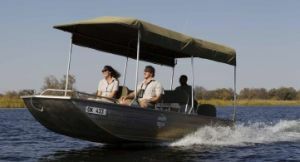 Swop an afternoon game drive for a motor boat safari, a great way to discover the delta. You’ll spot hippos & crocodiles plus dozens of different birds & finish the day at the best sunset spots. 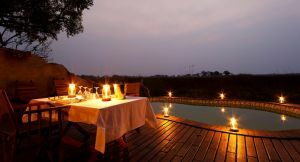 Breathtaking scenery, stunning sunsets plus super-exclusive accommodation: the Okavango Delta is one of the most romantic destinations in Africa. Honeymooners can expect private dining, spa pampering & plenty of romantic surprises. Home to around 500 recorded bird species, the Okavango Delta is a birder’s paradise, especially in the summer when migrant birds arrive. Ask for a specialist bird guide & try for the region’s ‘mega-tick’ – the ever-elusive Pel’s Fishing-Owl. Led by a professional guide, 4X4 game drives give you the best chances of seeing big game in the drier areas of the delta. Several lodges have a great reputation for vehicle-based game viewing; private reserves offer night drives & off-road driving too – ask us for the best ones. 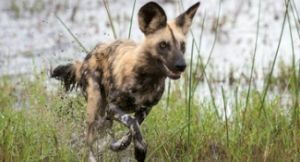 The delta’s grassy floodplains are packed with antelope, making them classic hunting territory for the highly endangered wild dog, one of the most sought-after sightings on an African safari. Head for the drier margins of the delta or ask us for recommendations. Whether you are a keen angler or just fancy trying your luck, many lodges offer fishing as an activity. It’s mostly catch-&-release but you can fish for your supper too. Serious fishermen will want to experience the delta’s infamous catfish run – get more info.